The stand up paddle board craze has arrived in Michigan, and it’s easy to see why. From open, ocean-like waves to hidden inland lakes and rivers, The Great Lake State offers some of the best freshwater paddling in the US. If you haven’t been yet, you better put it on the bucket list. Over on the lower peninsula of Michigan, the clear, shallow Platte River runs about 30 miles long and offers a laid back paddling experience for any and all skill levels. With a depth that rarely exceeds three feet, this leisurely trek carries paddlers along a meandering stream through grassy fields, sandy river beaches and forest greenery. Given the endless variety of launch points, you can determine how short or long to make your trip, so hop on the water, sit back and enjoy the wildflowers as you float by. If you’re looking to make a weekend out of it, post up at the Platte River Campground, right within walking distance of the river. 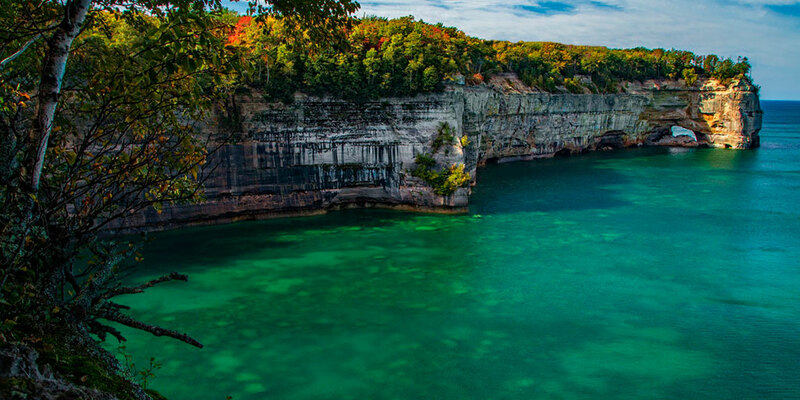 For more experienced paddlers, Pictured Rocks National Lake Shore offers 42 miles of breathtakingly spectacular scenery along the shoreline of Lake Superior. Paddle through colorful rock formations and arches with a backdrop of towering sandstone cliffs, beaches and forests. As always, being on a paddle board has the added bonus of allowing you to get up close and personal with caves, waterfalls and other features, like the plunging 70’ high Spray Falls. Most paddlers launch from the Munising area, which gives quicker access to cliff sections of the shoreline. If you’re less experienced, you’ll definitely want a tour guide to help you navigate, as the water is chilly and conditions can be somewhat challenging. ISLE Ambassador Steph Meyers advice? “Always check the forecast. The lakes look mellow compared to the oceans but they can be cold and storms or strong winds can come out of nowhere making it difficult to get back to shore.” Winds and waves can be unpredictable; shifting from glass smooth to stormy in a matter of hours, and there are long stretches of steep walls to the water line, so be prepared with the appropriate gear and be sure to check the report before heading out! Also not to be missed; the Sleeping Bear Dunes offer a profoundly beautiful landscape of sweeping mountains of sand, shaped by ancient glaciers. The dunes, perched above Lake Michigan, are renowned for their natural beauty and offer visitors some truly incredible scenery. Enjoy the Sleeping Bear Dunes National Lakeshore (which technically includes two of our other paddle spots – Platte River and North Bar Lake) from the waters of Lake Michigan for unforgettable views that you simply can’t experience standing on the shore. This spot offers 35 miles of pristine sandy beaches, as well as bluffs that tower up to 500 feet above the lake. As with the majority of paddling destinations in Michigan, this one can be unpredictable. So once again, make sure you’re prepared with the appropriate gear in case you encounter cold temperatures, wind or fog. 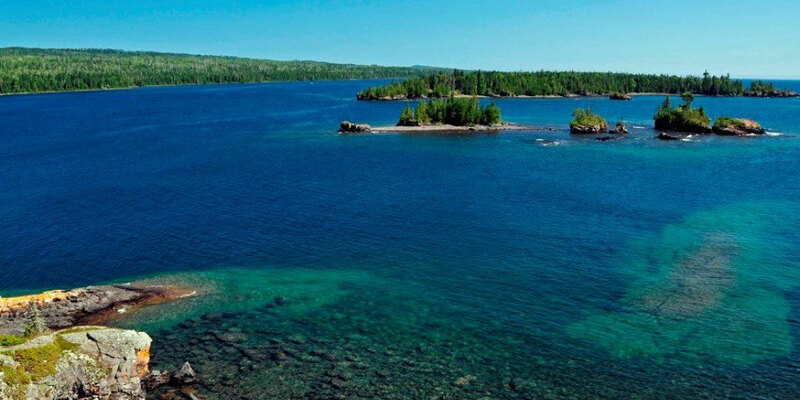 Isle Royale is one of the best kept secrets in the Great Lakes. Surrounded by the cool, crystal clear waters of Lake Superior, this is the spot to go if you want to experience a wild, untamed landscape away from the usual throngs of tourists. Paddle along the rocky coastline or navigate the beautiful inland streams and lakes – you might be lucky enough to catch sight of the infamous wolves or moose that populate the island. There are numerous camping spots and approximately 170 miles of hiking trails, making it well worth a weekend trip. Even better, you might catch Aurora Borealis if you go early or late in the season. Make sure you time your visit well as this incredible spot is closed off to all visitors from November 1-April 15. East and West Grand Traverse Bay reach over 32 miles in length, and are rarely wider than four or five miles. Sandy bottomed and crystal clear, the bay is known for its calm, peaceful paddles as well as its great downwinders, which are especially prevalent on the eastern side. 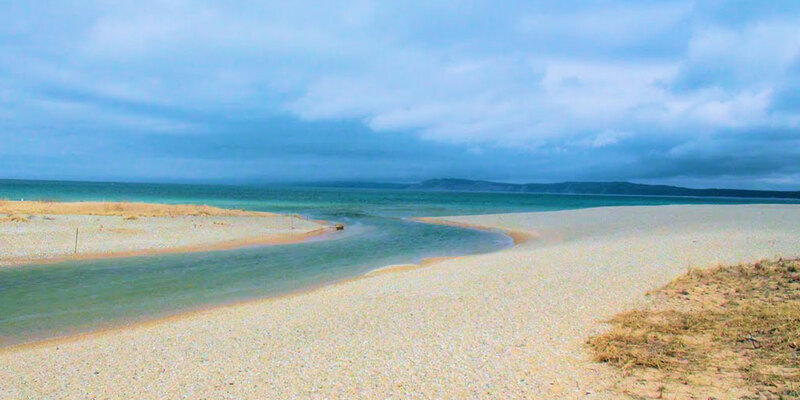 With easy public beach access you can find a good starting point just about anywhere, plus there are plenty of picnic spots for a post-paddle meal. This is a great spot for beginners and more experienced paddlers alike. 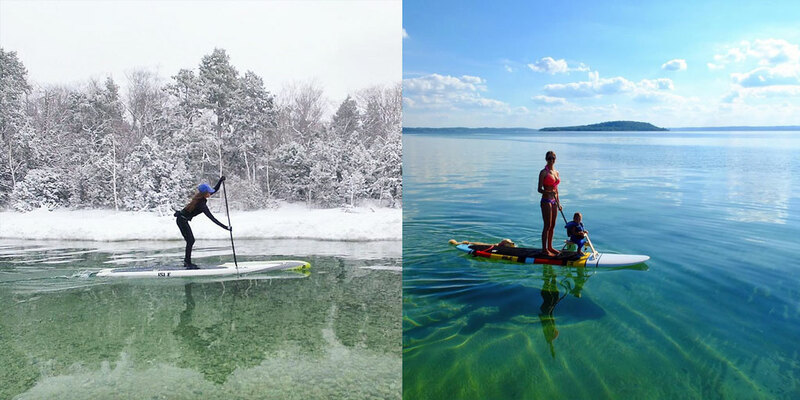 Whether you’re looking to take the family out for a calm day on the bay, or seeking a more intense downwinder paddling experience, all can be found on Grand Traverse Bay. Can’t decide between ocean-like waves and calmer lake paddling? Not to worry – just head to North Bar Lake, where you can find both. 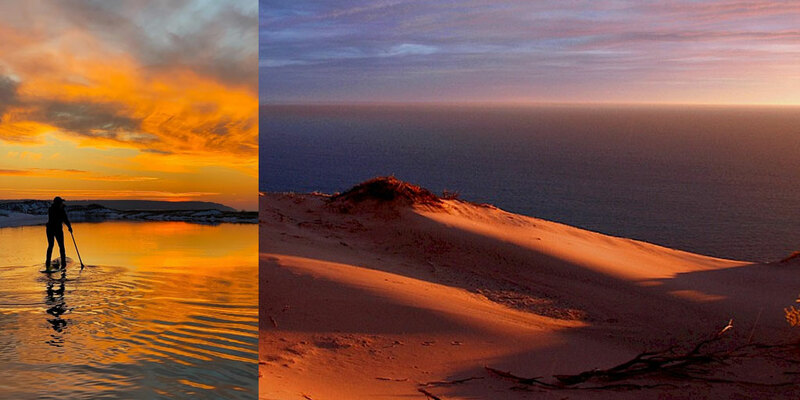 The smaller lake is separated from Lake Michigan by just a low sand dune, and the two are connected by a shallow inlet so you can travel between them with ease. 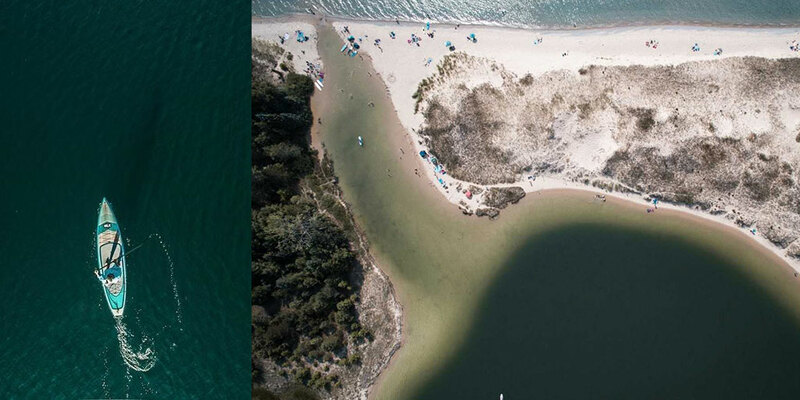 North Bar Lake offers sandy clear shores and warmer waters, ideal for kids and families to play in, while the big lake offers a choppier, more challenging paddle on refreshingly cooler water. A large parking lot and easily accessible restrooms ensure you have all the amenities necessary for an easy day out on the water. All in all, there are more killer SUP spots than we can count in Michigan, and this just scratches the surface. 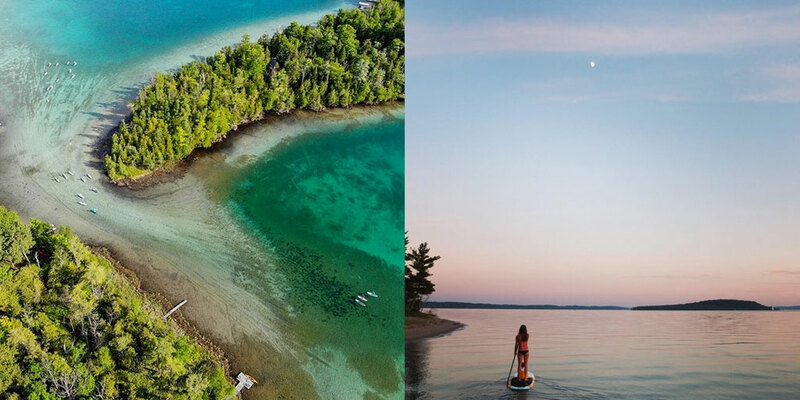 But no matter what you’re looking for, whether it’s a beginner level paddle board adventure or a speedy downwinder, the Mitten State will deliver. If you need help choosing the right board for your trip, we’ve got you covered – and if you’re just looking to rent, there are plenty of options to choose from in the area. Do you have a favorite SUP spot in Michigan? Share your photos below!